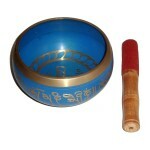 Singing Bowls have been used in meditation, healing and ritual practice for centuries. It has been said that they produce the sacred sound of "OM"
To use the singing bowl, you may strike the wooden mallet against the bowl to induce a glorious lingering resonance. 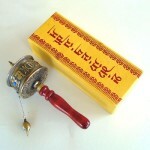 Another method is to rub the wooden mallet around the outside of the top ridge of the Singing Bowl so as to produce a smooth subtle vibrational ringing sound. Gently increase while the bowl begins to vibrate.